• I’m fine with the new helmet. The pattern on the crown doesn’t bother me, and neither does the wraparound logo. Yeah, it was sort of quaint how the old logo didn’t connect in the back, but that was because old helmets used to have a center ridge. Almost nobody wears that kind of helmet anymore. Form follows function and all that. • I’ve never liked the neon snot tone. To me it’s a joke color, a “Don’t take me seriously” color. It’s the color they make the vendors wear so you can pick them out in a crowd. You wouldn’t want that color on your car, or your house, or your clothing, so why would you want it on your team’s uniform? Unfortuantely, there’s a lot of it on the dark jersey and the dark pants, so that combination — which is probably what they’ll be wearing most of the time at home — looks like a total clown costume to me. • The white components aren’t so bad. The white jersey and pants have a lot less neon snot, which makes it easier to assess and appreciate the layout of the graphics on their own terms. The pants striping no longer looks like something out of the UFL, and ditto for the collar pattern. The team name on the clavicle doesn’t bother me in this context either. So if they ever actually wear the blue jersey with the white pants or vicey-versey, the white component should go a long way toward mitigating the problems with the blue component. • The gray alternate: Who really cares. They can try to give it a cool name (the one they’ve chosen is too ridiculous for me to actually type out here), but the only real difference between the gray alt and the white-on-white uni is that the gray one looks like it needs laundering. This is the one thing a Nike design should never be: boring. The uni numbers are kinda cool. You know, because of the background pattern. Provides the illusion of texture, which I dig. We need another nickname. That little triangular-ish shape on the shoulder was clearly designed specifically to house the swoosh. Just as we came up with the term “Ree-box” for the annoying logo creep formatting on NHL jerseys, we need to come up with a name for this. The floor is open to suggestions. Overall, it’s not the worst design in the world. Some good, some stupid. But the neon snot feels gratuitous and destroys a lot of the potential pleasure for me. 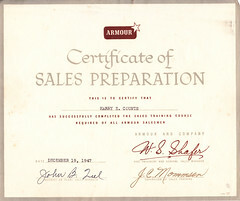 Two of my favorite things — meat and found ephemera, including the Armour Meats sales training certificate shown at left — come together in the latest entry on Permanent Record. 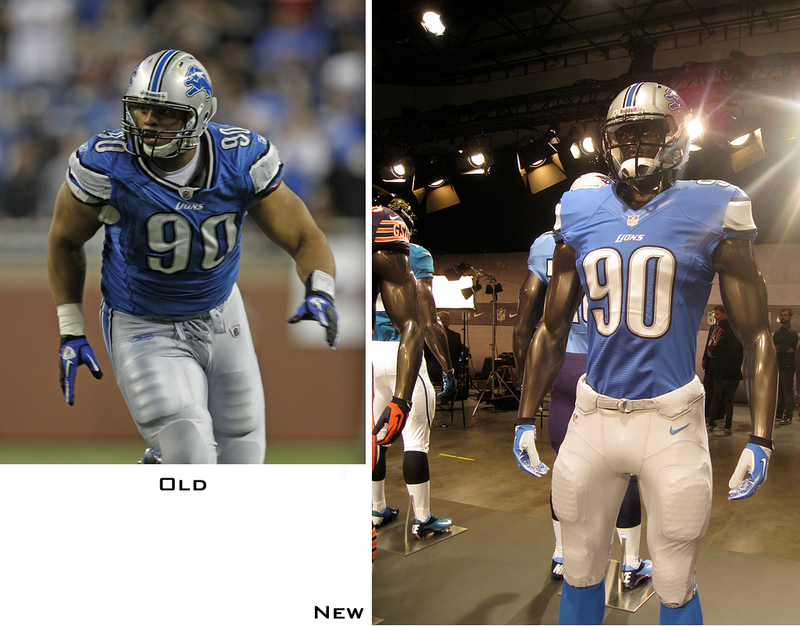 Uni Watch News Ticker: NFL adjustment that I missed from last week: Now that the Lions have adopted the Nikelace, they no longer have their collar piping. I’ve added this to the table from last Wednesday’s entry. … And an MLB update: The Giants’ have switched from nameplates to direct-sewn NOBs new headspooned road grays on their new headspooned road grays (good spot by Jamie Costello). ”¦ Three of the Rays’ four infielders yesterday wear wearing the team’s glorious striped stirrups. 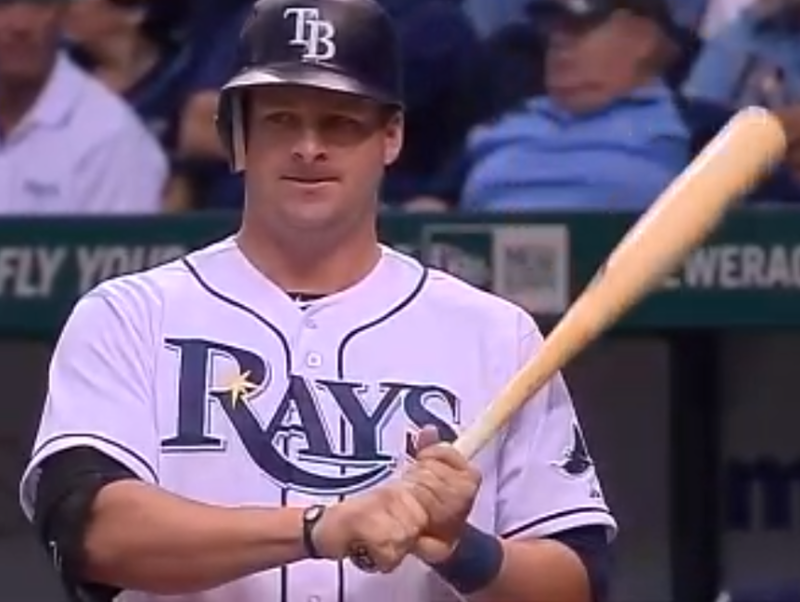 ”¦ MLB now has a new bare-handed hitter: Stephen Vogt of the Rays, who made his big league debut on Friday. Looks like he’s been going without gloves for a while. And like so many bare-handers, he’s a catcher (from Dave Krol). ”¦ The Syracuse Chiefs wore throwbacks for their home opener (from Rick DiRubbo). … “The Minnesota Stars, a second-division soccer team in Minnesota, introduced their 2012 jerseys on Thursday,” writes Jon Marthaler. “The away jerseys have a feature that I’ve never seen on a jersey: The numbers contain pictures of the team’s supporters’ group. They have a number of other fan-centric details, especially the away jerseys, which have the supporters’ group logo and slogan on them as well.” … This is pretty cool: The Padres have a kids’ group whose logo features a very young swinging friar. … New football helmet for San Jose State (from Andy Coffaro). ”¦ Key quote from this SF Giants roundup: “Rookie reliever Dan Otero will wear #87 on the trip, a spring-training type number. He said clubhouse manager Mike Murphy wants to give him #37, which was Chris Stewart’s number, but the new collective bargaining agreement requires number changes be approved by the commissioner. That’s to placate licensees who get ticked off when a player changes his number on a whim, sticking them with hundreds of thousands of dollars of outdated merchandise” (thanks, Brinke). 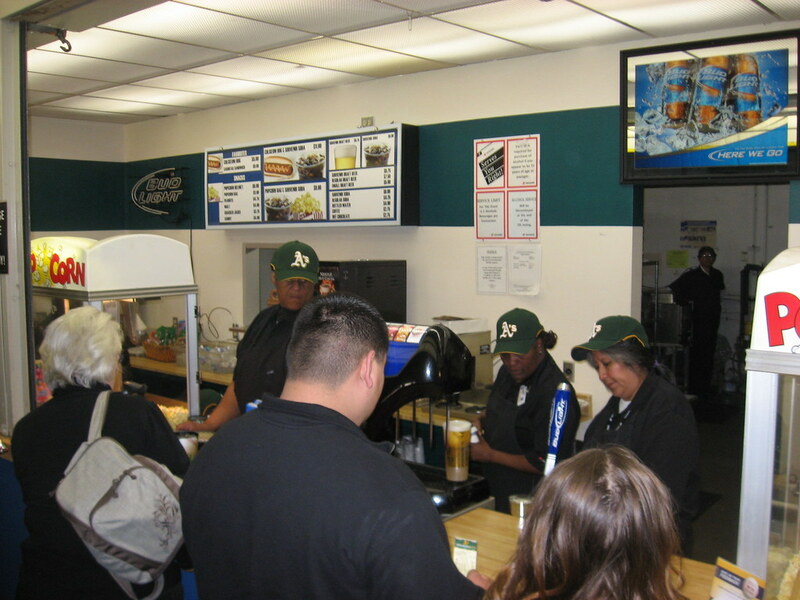 ”¦ Sam Lam reports that A’s vendors are now wearing last year’s BP caps. ”¦ If you’ve been waiting for stirrups wallpaper, your wait is over (from C. Trent Rosecrans). ”¦ Browns beat reporter Tony Grossi says the team will have an alternate jersey in 2013 (from Jamil Smith). ”¦ It’s not clear if Lebon James has been wearing his headband inside-out, or if he’s striking a blow against logo creep, or something else, but his headbands have not had the NBA logo lately (from Barron Calvert). ”¦ Spectacular MacGregor Goldsmith label on this old baseball jersey. 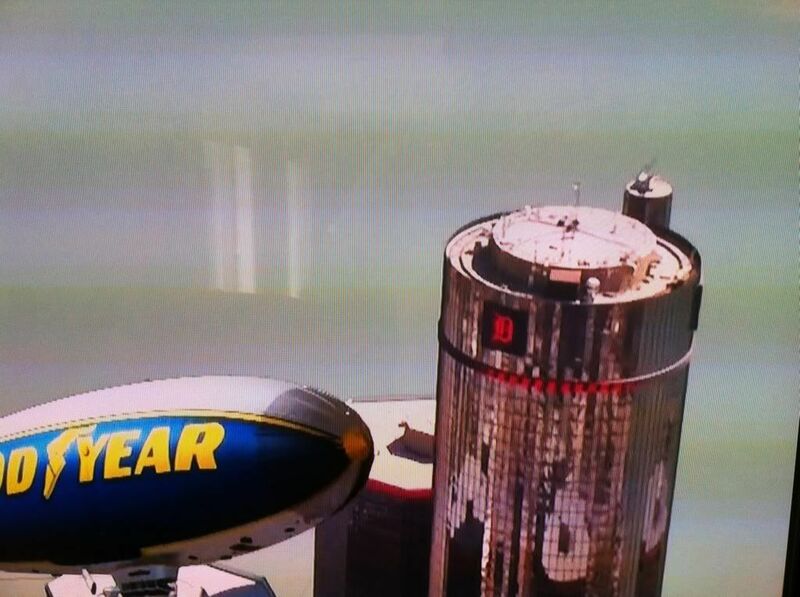 ”¦ The GM Renaissance Center currently has a Tigers logo on it (from Tim E. O’Brien). ”¦ Also from Tim: White Sox catcher Tyler Flowers doesn’t just paint his fingernails — he paints his fingers. ”¦ Benjamin Smith reports that the peanut vendor behind the plate at PNC Park has been wearing bumblebee-era Pirates garb. 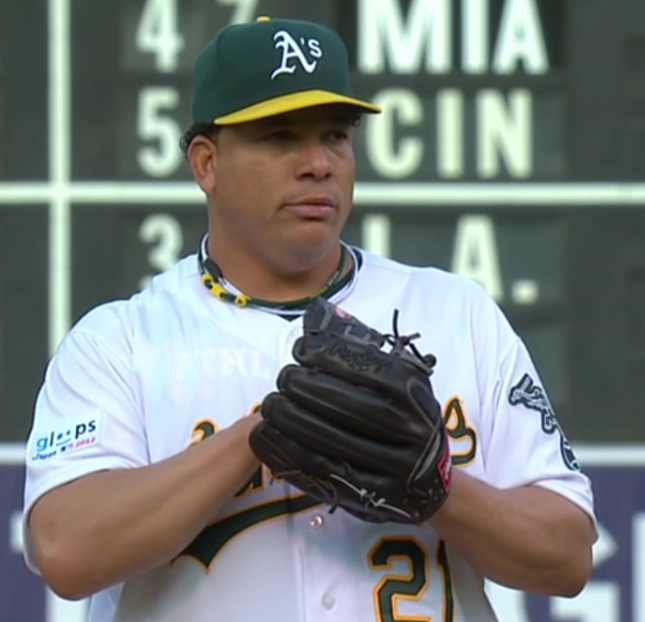 ”¦ Shortly after Saturday night’s A’s/M’s game started, Mike Rowinski informed me that Bartolo Colon was still wearing his Gloops ad patch from the series in Japan. I made that screen shot and then shot a quick e-mail to A’s equipment manager Steve Vucinich. He wrote back a few innings later: “I saw it just before your e-mail. Don’t know it got away from the authenticators in Japan.” This may be the first ad patch ever to appear in an MLB game on American soil. ”¦ The Sharks will once again wear black for the playoffs. 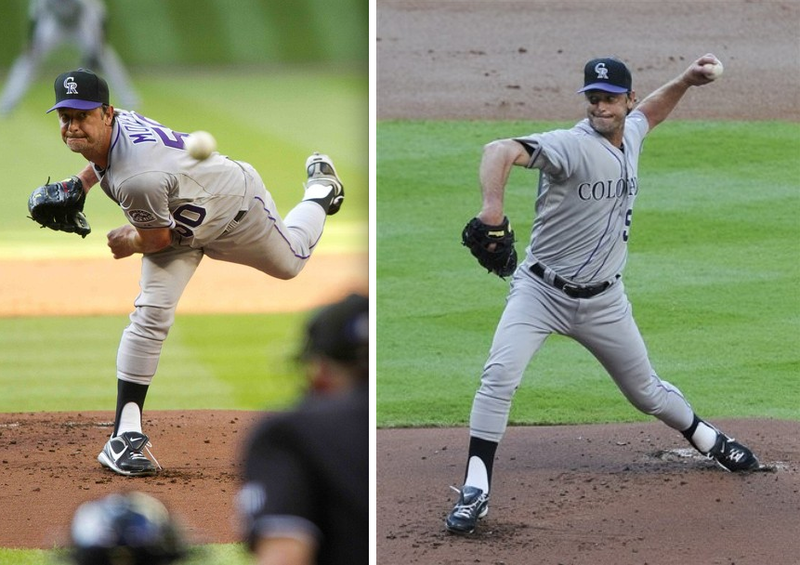 ”¦ Jamie Moyer was showing a bit more sani than usual in his Rockies debut on Saturday. ”¦ “Last weekend I was in a shop that featured a late-1960s Tudor Electric football field in the window,” writes Michael Wissman. “For the helmets ringing the ‘stadium,’ the Browns were represented with the never-used ‘CB’ helmet (although the helmets on the little Browns players did not have the logo), and the Saints’ fleur de lis was completely different from any interpretation I’ve ever seen.” ”¦ Move over, George Brett: I don’t think I’ve ever seen anyone put pine tar so far up the barrel as Robinson Cano was doing on Saturday. ”¦ This is odd: Topps is coming out with a set of bat knob cards (from Adam Jackson). 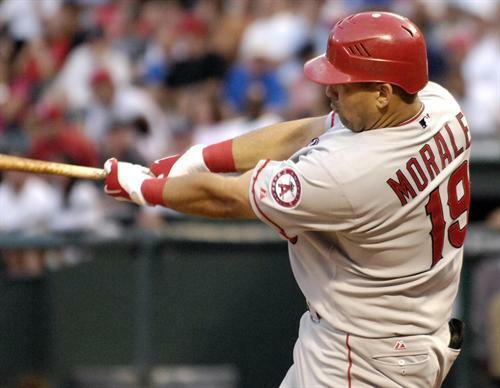 ”¦ Kendrys Morales’s left-sleeve piping was coming undone yesterday (from Zach Adams). ”¦ We’ve talked before about the Knicks briefly using a Yankees-style “NY” logo on their shorts in the 1980s. In a similar situation, Christian Cisneros pints out that the Warriors were using a Giants-style “SF” logo in the 1960s. 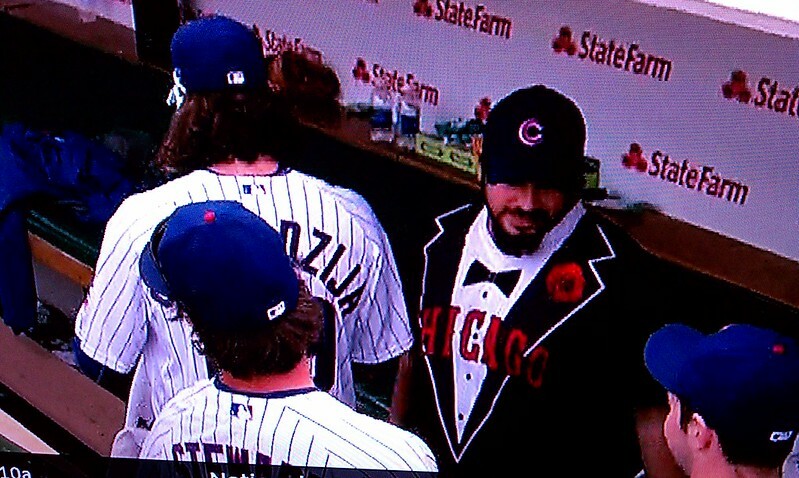 ”¦ ” After Jeff Samardzjia pitched a fantastic game for the Cubs on Sunday — and was subsequently shaving cream pied — this awesome tuxedo/jersey T-shirt was seen in the dugout being worn by (I think) Blake DeWitt,” says Chad Peiken. ”¦ ” According to the ModSquadHockey message board, the Flyers held an equipment sale this weekend, including a whole bunch of updated Cooperalls apparently made for the Winter Classic,” writes Chris Reber. 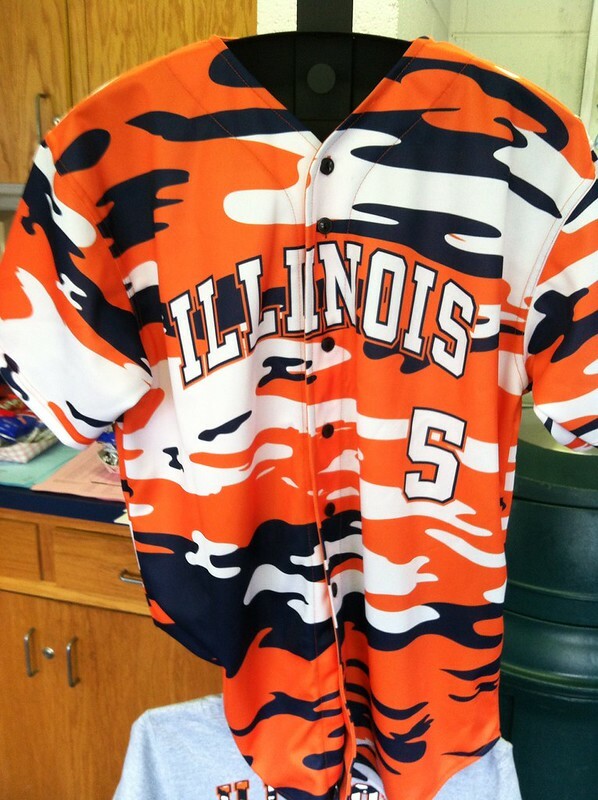 “The story on the board is that Bob Clarke shut down the idea, but I’m sure Uni Watchers can find a better explanation than that.” ”¦ Illinois baseball is planning to wear a camo jersey that looks like a Bengals tribute (from Orion Buckingham). ”¦ Tiger Woods’s caddy must be a Rangers fan (from Alan Kreit). ”¦ The Pittsburgh Power went G.I. Joe the other day (from Yancy Yeater). ”¦ Brian Richter made some screen shots from old footage showing the 1952 Dodge City Demons — that’s a high school football team from Kansas — using white helmets for their receivers during a night game. As Brian points out, Alabama did this back in the 1960s. Quoting from the Helmet Project: “[A]t times during the 1960s, Alabama used white helmets on eligible receivers in games at night or when another team’s helmet matched or resembled [Alabama’s] in color.” ”¦ Man, the 1995 Birmingham Barracudas (CFL) had some seriously weird uniforms (from HHH). ”¦ You can now get the Orioles bird on a Maryland license plate (from Dan Cichalski). 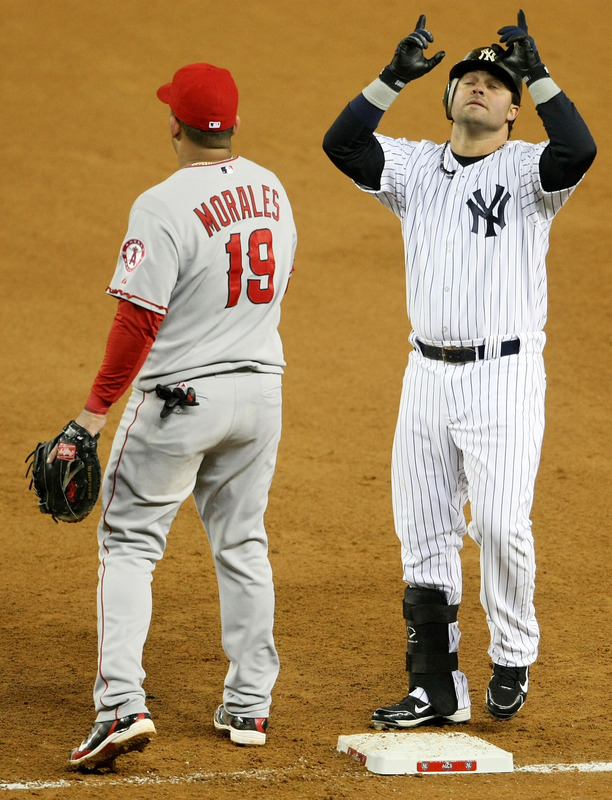 ”¦ David Traub is keeping track of the jersey and cap colors worn in every MLB game this season. ”¦ Our man Teebz is running his annual hockey playoff pool. “For the prizes, I have already secured jerseys, t-shirts, DVDs, books, and other paraphernalia,” he says. “No knowledge of the game is necessary — it’s all about picking a winner. And it’s free! 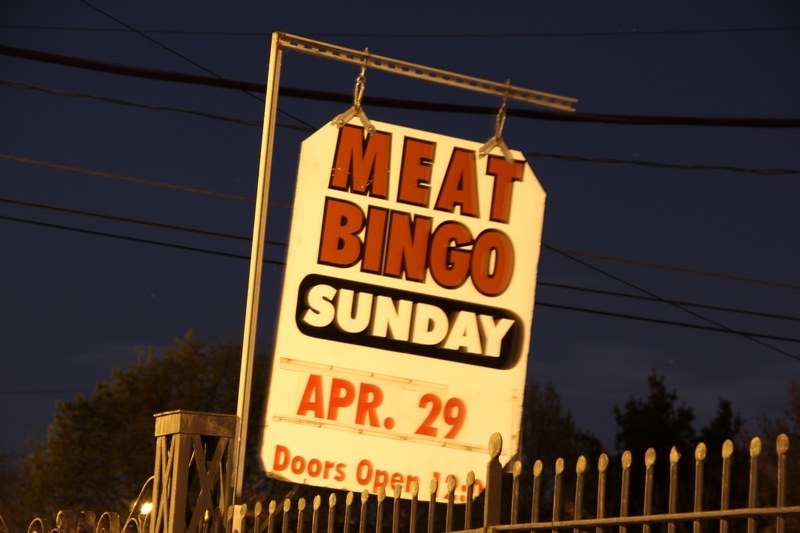 Any questions can be sent to me through the links on the page.” ”¦ Kathy Kruger was driving past a church in Allentown, Pa., when she spotted a sign she knew I’d like. Kicking the Habit, Day 7: Mission accomplished, people. I had a weak moment on Saturday, when I made a batch of mocha brownies and ate one of them, warm, right out of the pan. Reeaallly wanted to wash that down with some Diet Coke but managed to resist the urge. After that it was smooth sailing through the end of Sunday, which completed my soda-free week. Reporting back to y’all each day definitely helped — thanks for listening. Will I keep going? Maybe. More likely I’ll go back to the way I used to be many years ago — having a soda now and then but not consuming it in mass quantities every single day like I’d been doing since 2002. Just knowing that I can go a whole week without the stuff — something I honestly wasn’t sure I could do — is tremendously encouraging. If I can do that, I’d like to think I can drink soda in moderation. Looking ahead: It’s gonna be a messy week. I’ll be off the grid today (spending the day with my Mom, cuz it’s her 88th birthday, don’tcha know) and again on Wednesday (ESPN meetings in Bristol); I have ESPN columns running tomorrow (about women’s uniforms, in connection with the 40th anniversary of Title IX) and Thursday (about the NBA’s possible move toward uniform ads); and I have errands to run in Manhattan on Thursday. The upshot of all this is that I’ll be super-pressed for time and will therefore be much more selective with the Ticker. You can help by only submitting things if they qualify as real doozies. My apologies in advance for any submissions that don’t make the cut this week — thanks for understanding. I think we should call it a “swoosh bubble”. It kinda looks like a text bubble from a comic. Maybe we should extend the definition of Reebox to any shape on a uniform that’s there specifically to display a manufacturer’s logo. The concept of Nike using a Reebox should bother both companies. Agreed. Reebok has done some groundbreaking work in logo creep and should be thusly recognized. That shoulder/sleeve thing reminds me of the old Atlanta Braves freather uniform in reverse. It’s sort of a marquee for corporate douchebaggery, so how about the Douchquee? It’s shaped like a mushroom or mushroom cloud, I propose “swooshroom”. Kind of a doomsday feel to it. Bermuda Triangle. Since it is a triangle and Nike is where good design seems to disappear. Well that was less harsh than I thought it’d be. I still don’t get the hatred for the bright green though. It’s really not any brighter than the yellow worn by Michigan. The gray alt *should* be worn as their full-time road uniform, but the NFL has to have it’s stupid mandatory white jersey rule. me neither. works just fine the way they’re using it. Paul, did you notice that the TV numbers on the Seahawks jerseys do not have a neon yellow outline as the main numbers do…nor are they made of the same patterned material as the front and back numbers? Good point. The TV numbers don’t have the pattern; I don’t know if they’re made of the same stretch-twill material. I was thinking along those lines: it’s shaped like the rating patch for Specialists (E-4). The lead picture is the first time I’ve seen a straight-on image of the back of the Seahawk’s helmet. Sure looks to me like I’m looking a Seahawk straight in the face! Could be … I’ve never looked a Seahawk in the face, so I was guessing. Looks crooked to me…which makes me wonder how easy/hard it is to apply a wraparound helmet logo. Also makes me wonder if we’ll see more helmet logo decals being redesigned to accomodate the countours and ventilation holes of modern helmets. Presently, the Seahawks decal doesn’t really "accomodate" the design of the Speed helmet, since it renders the rear vent cut out useless. That’s what I’m talking about. Helmet vents are not cosmetic touches…they serve the function of keeping the head cool. I’ve thrown this out for discussion before…I wonder if these logos which cover ventilation holes might invalidate a helmet’s warranty. Is Gio Gonzalez still wearing white shoes, while pitching for the Nats? why ask a question you clearly have an answer to? They look like saddle shoes. The logo on The RenCen is a video board that the can change. It is commonly the Red Wings logo for the playoffs. I’m quite positive the Giants switched from nameplates to direct-sewn NOBs last year. I’m having trouble finding the link but I remember there being a Uni Watch item about it (not to mention an entire season of me watching them that I can vouch for). You are correct. The Giants went to direct-sewn NOB for the 2011 season. 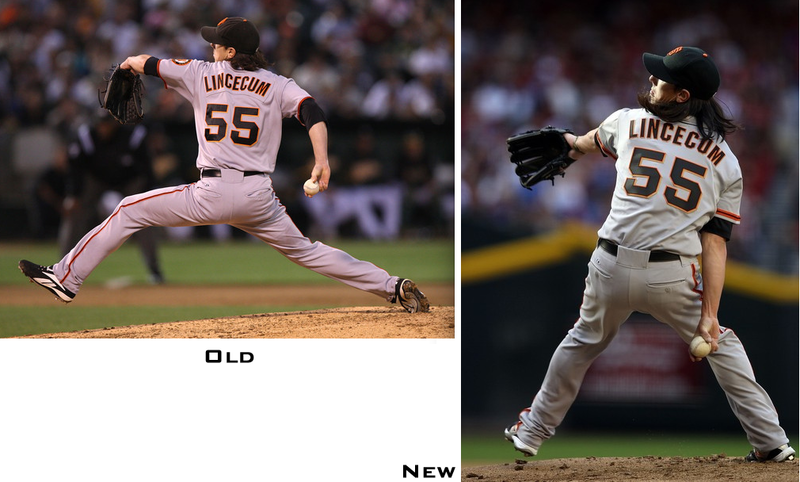 The ‘old’ picture of Lincecum that Paul shows is from 2010. You can tell because the patch on the sleeve of the road jerseys changed in 2011 to the same patch as their home jerseys. The patch you see there is now only used on the Friday night at home orange alt. I will never understand the name plated NOB’s. Are these done to save money? If so, why not leave the names off then? It looks much better IMO! The “swoosh bubble” (I like that!) was described (I think in the Seattle Times) as part of the Pacific Northwest Coast Salish design on the shoulders sort of like what the Seahawk logo used to be before they made it “angrier”. Blue and green are such great colors for the region. I like the darker uniform, but this color scheme, like the previous one, commits to nothing. Now I have a question, should the Seahawks now be lumped together with all the other teams that are profiting from Native American imagery? The teams design from the beginning has always had this but to my knowledge they haven’t paid for the right to do so. I have read in different places that the Salish people are proud of all the nods to them but the fact remains that the team is making a profit off of their works. I just want all the UW’s out to weigh in. “Now be lumped?” The Seahawks’ logo was always based on indigenous art traditions. They’re just going a bit further down that road. In my opinion, the sports teams that do this (Seahawks, Canucks, etc) don’t owe any money to the tribes unless they used a specific piece of work designed by a specific person. I don’t think someone or some people can own a style. Only a specific work. The sports teams could argue that their designs are INSPIRED by a style, which would not be the same. Seattle has had a few teams with Coast Salish-inspired designs. The original Seahawks’ logo was quite authentic looking as was the 66-75 logo of the old professional Totems hockey club. I always wondered who designed that, because it looks like it may have been designed by a native artist. The junior hockey Seattle Thunderbirds have a similar logo. Mort makes an interesting point, but I imagine the tribes would speak up if it were an issue. The current Seahawks’ and Canucks’ logos are clearly inspired by the Coast Salish, but not very authentic looking. Nikelights. If you think about it, they look like the blinker lights on a car. If more teams do end up doing this, my guess is they’ll make the nikelights a third color, I.e yellow for Chiefs and cardinals, teal for Jacksonville, Orange for Miami etc. I’m not a fan of the neon green, either. But that’s a purely aesthetic preference; it’s a question of what I think looks pretty. It’s not a substantive critique of the design for me, so I can’t hold it against the Seahawks uni. That issue of personal preference aside, I generally like the new Seattle uni, and actually much prefer it to what it replaces. Typical Nike, though, in that there are too many uni elements. 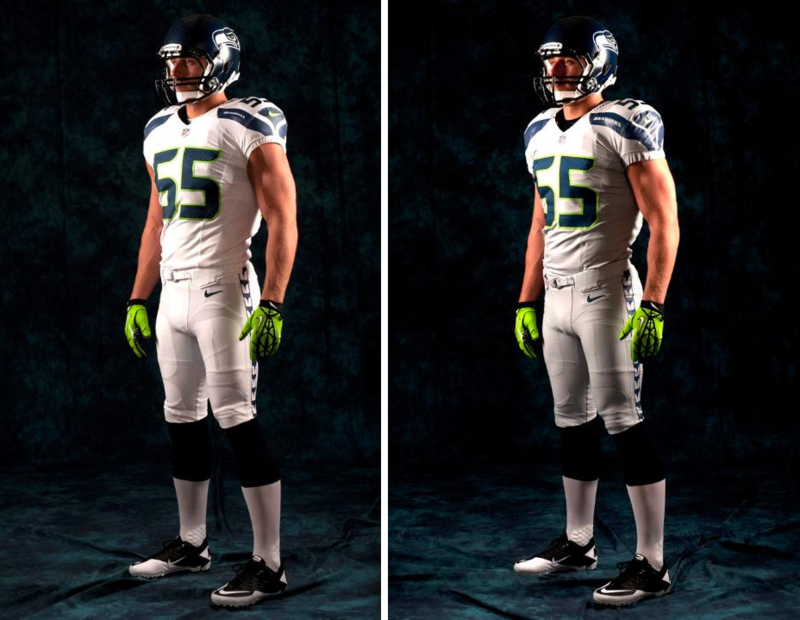 The Seahawks are a team that could totally adopt light gray instead of white, if the league would permit it. But white and light gray? Too much. Choose one, ditch the other. And none of these unis work for me as monochrome. 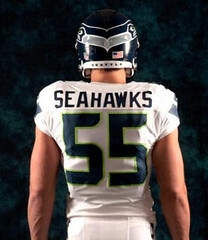 I hope the Seahawks do the blue/white or white/blue thing pretty much all the time. The NFL would allow the gray to replace the white because teams need a “dark” and a “light” uniform, not colored and white. I think that ruling was done in the ’50s so the Rams could wear yellow everywhere. In this context I like the neon green: with the navy is makes a good contrast, as opposed to the “suicide blue” they used before. So, Nike did do a decent job redoing the CHawks, but I kind of wish it wasn’t so damn cluttered on the uniform. We need to be clear, it isn’t exactly “neon” green, at least not in the sense that deer hunting gear is that intense blaze orange that seems to be its own source of light. I’ve seen the Reebok lime green Seahawks sideline hats and jerseys, and the green was bright, yes, but not particularly brighter than the Browns and Broncos orange or the Chiefs and Packers cheddar. It doesn’t “leap at you from the shelf” like deer hunter orange, or the green on the vests of highway construction workers, to which the “neon” adjective is often ascribed. It’s what what might commonly be called a bright lime green. Sure, it’s fun to snipe at as “neon,” but in the Seahawks case it just plain isn’t. At least it wasn’t on the Reebok versions, anyway. It was, as noted, more like Michigan’s yellow. Can’t speak to the Portland Timbers or other teams in the Pacific Northwest whom seem to have adopted that bright lime as a color for that region. Yeah, I guess. We could call it “action green”, since that’s what Wikipedia says. 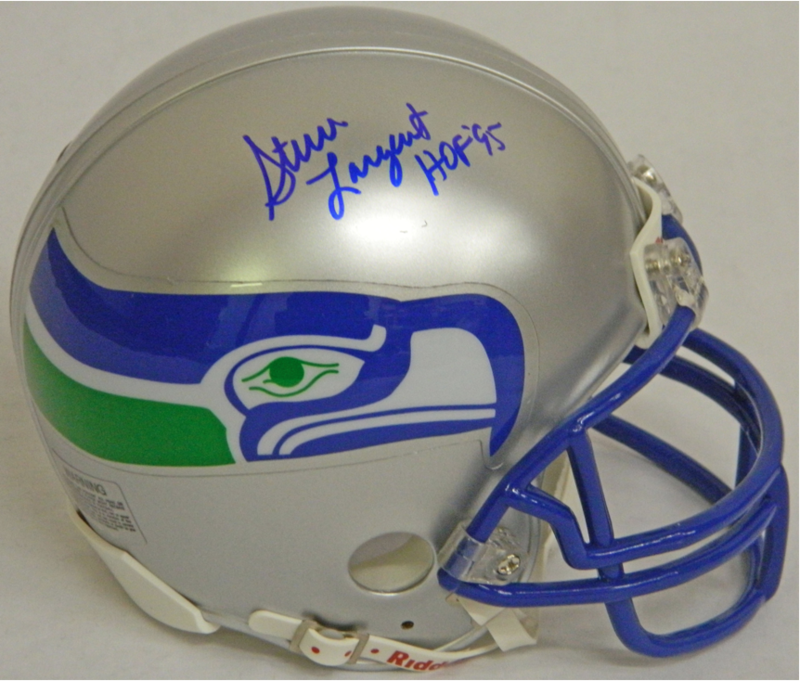 Also, if they serve any type of trustworthy historical source, the Seahawks never wore “neon green”. It was always called lime green. Although, the reason I call it neon as opposed to lime was it always seemed brighter than the other greens around the league. I guess maybe with it being in the pants stripe with navy, it looked brighter because of the contrast. Also, is it really called “College Navy”? I think that I’m on firm ground in saying that the green in question is commonly called “neon green.” For example, go down to one’s local Office Stapot or whatever, and one will find photocopy paper even less bright and saturated than Seattle Snot Green labelled “neon green.” “Neon” is just a description of brightness in common English, and it covers the Seahawks’ hue. If anything, the alternative to “neon green” wouldn’t be lime green – neither limes nor lime juice are that color, and if you’re served a margarita that color, it’s a crap margarita made mostly from flavored syrup – but “hot green,” as in hot pink, but green. isn’t that the color of radiator fluid? “Radiator Fluid” Green? What’s the pantone number for that? Probably the same number for poison control. It’s the same hue as the Sounders kit, which the club describes as Rave Green. It may not be popular elsewhere, but up here in the mossy corner it’s caught on and become rather popular. Our tastes are quirky , which is why we started drinking burnt ground coffee and industrially-hopped beer many years ago. I’m pretty sure it’s mandatory white jersey. If it was just dark or light, the Rams wouldn’t have stopped wearing the yellow in ’58, after they’d used it as their only jersey from ’51-56. There’d also be no reason for the current Chargers or Panthers to have white jerseys as obviously navy/powder or black/powder would work effectively as dark & light. Yeah, if/when they wear the gray, it’ll be in the place of white (just like the Patriots silver alt), but the NFL won’t let them use it as their primary light uniform. The NFL dumped that Ram thing when mandatory white came in. The Rams then ditched the cheddar jerseys, changing from cheddar everywhere to royal at home and white on the road. Not sure what the policy is now. Someone here will know. Opposing teams uniforms needing enough contrasts between them on black and white TV was the main factor for mandatory white, right Ricko? Yup. And it still works better in color. Best for the players in the game, too. Something they discovered after they went to it. If it’s so great, why does the NFL need to have a rule for it? Couldn’t possibly be to avoid pointless game by game approvals, could it? Or for simple logistics, management, coordination of things? Because settling for “good enough” is stupid when “optimum” is so easily achieved? I’m not getting into this today other than to ask if anyone watched the women’s NCAA finals. On TV. Don’t throw up a photo and analyze the snot out of it. Not even close to the same thing as watching it live and with movement. Baylor in carbon gray, Notre Dame in green. Was a little tough to find the players in the full court shots. Meanwhile, the Notre Dame players on the bench in their white shooting shirts, and the Baylor coach in white slacks, were easier to spot than the players on the court. If we don’t understand how light works, how colors behave, and how the human eyes receives and processes data, go back to 8th grade science class. Or talk to an art teacher, or TV technician, who will fill us in. It’s not always optimum. Try watching the Panthers in blue on a sunny day. The light blue vs white is absolutely crap for contrast in sunlight. The mandatory white rule is stupid. If everyone would wear white anyway, you don’t need a rule. If a few teams don’t want to wear white, why force it? Is it really so wrong to let a team dictate it’s own image? The NFL knows exactly what jersey colors each team has available before the season starts. It’s not like college where a team might trot something out at a moment’s notice. Why not, at the time the schedule is made, spell out exactly what combos would be acceptable. The home teams lay out their color choice before the season starts, anyway. So it’s incumbent upon the visitors to bring jerseys of an approved color. Failure to do so results in a loss of timeout or something. Ah, we cite an exception in a attempt to disprove the rule. Or the common sense. Or the simple science. The Jeff just has thing for hating white. Yep, I agree with Mr.Rogers here. I think the Seahawks could do something similar to what the Giants do, and that’s wear the blue/white/alt. color jerseys with the gray pants. Insertion of agreement here. I was initially turned off by the Seahawks’ kit. But when I saw pictures of the blue jersey over white/grey pants, I started thinking…’hmmm….this might not be so bad.’ I dig the more saturated (?) blue color. ok, where is arr scott and what have you done with his old screename? Thanks, Phil. After many months of getting cascading redirect errors, UW is once again visible to me in Safari, and I forgot to check & update the screen name. It’s me, and not The hacking me to make it look like I like the new Seattle duds! Why does everyone assume that I’m a hacker? What do you have against hackers, The? It’s a title of honor. Heck, normally if I read praise for a Nike uniform anything like the new Seahawks togs attributed to me, I would assume that The Jeff had hacked my account. Just because this is the kind of uni I don’t normally like, but that I expect The to love and defend from stuck-in-the-mud traditionalists like me. Someone just e-mailed me “Nikiosk.” That’s my favorite so far. Gotta run to Long Island now — see you all tomorrow. I’m reserving full judgement until I see them in a game. But I hope this leads them to do away with the monochrome blue homes, because their blue-white and blue-wolf grey (ha-ha!) look much better. Also, the shoulder triangle looks a bit like the Space Needle, so maybe that was the thinking, but it’s closest resemblance is to Bespin Cloud City. And, yeah, the Poisonous Frog Green Bespin shoulder patch looks awful. billy ripken. billy ripken. billy ripken. Don’t you think the Marlins will switch to white at home more often when the weather turns hot in Miami? Not when they can close the roof of Marlins Park and turn on the air conditioning. Doesn’t Loria love black? As long as he’s the owner, the Marlins are going to keep using that color. But I really think they should have matching black pants; then they could own that color. Perhaps instead of Wolf Grey, they should call it Wolf White and just sneak it in on the road. I should join the ‘rup club just to get a pair of those beauts. Melo was also wearing his ‘go green’ headband inside out. With Seattle, there is simply too much. Give me the helmet pattern, or the clavicle striping, or the shoulder treatment, or the number pattern, or the neck/pant striping. Or maybe give me two of them. But there are just too many disjointed design elements for me to get behind this uniform. Look at 2011 Oregon. The shoulder wings might be a little wacky (I like them, personally), but they pretty much leave it at that (aside from unconventional color combos and the carbon fiber helmet). THAT’s how it should’ve been done. Totally spot on. Same thing applies to Oregon’s Rose Bowl uniform and, quite frankly, a lot of Nike-designed stuff. The pattern on the numbers is gonna be mostly invisible from standard TV broadcast angles. For all intents & purposes, they just have reflective silver numbers. It’s just like the Ducks really, that picture you linked has the carbon fiber helmet, but it basically just looks darkish silver. I keep looking at that new Seahawks outfit, with an open mind, trying to like it. Really trying. But it’s not working. It’s a jumbled mess. Too much thinking, too many ideas–bad ideas. It makes me more pessimistic than ever about the aesthetic decline of the football jersey. The truncated collar pattern looks tacky & out of place as well. That along with the shoulder & clavicle name tag is just unnecessary. Just too many frivolities done in Illustrator. From what year are those turn-back-the-clock Syracuse Chiefs uniforms? OK, I see now that they are from the late 1970s. Looks like a faithful recreation of the uniform from that area, except for using real belts. Paul, I am going to try your blowtorch-sear / slow roast method for steak either tonight or tomorrow. Question for you though – what are your feelings on the “reverse-sear” method? There seem to be a lot of people who feel that the sear is overrated and doesn’t hold in the juices like many claim, and therefore can be done at the end just prior to serving. Searing does NOTHING for retaining juices. It’s simply for the caramelized flavor. It actually causes MORE juice loss. I’ve noticed Kendry’s sleeve piping fraying for years now. Maybe it’s his lucky jersey that he doesn’t want to replace. I’m not sure, but I’ve noticed it’s getting progressively worse. This is from 2010 (and his roadie, no less). Here’s another shot from a different game. Paul did a column on Sevilla doing that (for money) on Dec 2011. Santos Laguna in Mexico did something similar with the names of 1,200 fans. It’s not the first time they do this and all you have to do is be one of the best in an internet game or submit as many codes (found in beer cups in the stadium) in as little time as possible via SMS. While I’m at it, The soccer ball is orange and the guy has an orange ribbon on his left arm due to a campaign against obesity in Mexico, it will be worn during April in all Mexican soccer matches. Sevilla do it, Atletico Madrid are going to do it, and Porto are going to do it. I snagged a spot on my friend’s favorite Sevilla player’s (Jesus Navas) shirt as an xmas gift for him. The only difference is that the Spanish/Portuguese clubs seem to be adding a red/blue tint to the pictures, so they blend in more with the rest of the uniform. Somehow I doubt there’s hundreds of thousands of dollars of Chris Stewart swag laying around. Shane, I was about to post this. The first aesthetic casualty of the ridiculous merchandise-sales-profit-protecting rules: a player forced to wear #87 in the regular season against his will (and against even the equipment manager’s will). I’d be surprised if there’s any demand at all for a jersey of #87 Dan Otero — a rookie — at this point in the season. So the poor young man gets humiliated so that Selig and Majestic never lose money when a big star player, for whom many jerseys have been made, changes his number. I’ve got a solution: forbid NOBs on jerseys. If a fan buys a #37 jersey because of the current #37, he “inherits” all the past and future players to wear #37. That’s how it should be. I’ve got two Cubs jerseys from 2005 (white home #48 and blue #37) that are number-only, and look forward to whoever gets these numbers each year for just this reason. Come on, Commissioner. Stop uglifying the players in pursuit of such a tiny sliver of profit. Haha, agreed on this. My friend has an NNOB #44 Red Sox jersey he bought when Jason Bay was with the team. I’ve been ribbing him for the past week or so about why he went and bought a Vincente Padilla jersey. What I was getting at though..I mean on like MLB.com, if you were to get a Stewart jersey or t-shirt, it would have to be custom ordered. I’m not sure if the Giants store at the stadium carries shirts/jerseys for every single player, but I would assume it’d be the same case there. I just don’t think there’s a warehouse somewhere sitting on a few thousand Chris Stewart shirseys. The crazy part is that it isn’t even about Stewart. He has been traded so #37 is now ‘open’. They will not let Otero change from #87 because that was the number that he was assigned for Spring Training and he can’t change it without permission. It would be interesting if the number change would have been expedited if it had been a ‘name’ player. Hypothetically, some team signs Roy Oswalt at the end of Spring Training but has already assigned numbers 1-86 o their coaches, men on the 40 man roster and non-roster invitees. Does Oswalt have to stick with #87 until MLB approves? I’d be for that rule – NOB serves no functional purpose, since it can’t be read by fans most situations anyway. Alternately, MLB’s shop makes it impossible to order a custom jersey with just a number, no name, for teams with NOB. The league needs to at least make it easier for fans to get number-only customization. Because we can’t let the uniform manufacturer be able to dictate trades. I know, but the logic that justifies it in the one case, justifies it in the other. The absurdity of permitting this kind of merchandising fee in a trade situation demonstrates the absurdity of applying it to the rookie-getting-a-lower-number-when-he-breaks-camp situation. Especially since the new number is available precisely because of a trade! I wonder how it is that this rule can even apply to numbers issued in spring training — spring training games are totally unofficial, anyone can play in them (even Billy Crystal and Garth Books), and numbers can be switched around all the time (such as when a guy forgets his jersey or something and plays one game wearing a wrong-sized #90 or the like). If this is how things are going to be, the scourge of jersey numbers in the 50s and 60s is only going to get worse. It might be a safe bet that within 20 years or so, baseball will have gone the way of hockey, with numbers from 1-99 assigned all over the place. That might even be better than what we’ve got now, with many rosters being “top-heavy” in the 50s and 60s because of low numbers being retired. Must have been a cold day at the park! Just guessing here, but I bet those are snoods. Ugh, yeah. They were bad enough when everyone was wearing them for soccer, please don’t let this be the new baseball trend. They returned to the original Willis Reed type from 1983-4, till they got rid of the NY in the early 90s. And get rid of the Subway Token? I don’t think that will happen. Subway tokens? Those have been gone for 9 years…how about a Metrocard logo? Right you are, Steve. I lament the cookie-cutter NBA warmups, and wish the teams were once again responsible for designing their own. When the new warmup sets come out, it’s always pretty cool to see the different color combinations of the warmups. Once that’s done, you’re correct; the sameness is off-putting. Nope, that’s a perfectly acceptable reason. We have the resources now to follow any team, regardless of geographic location, so it’s absolutely fine to root for a team because you like their uniforms, or stop rooting for them because you don’t. Wow…I am in complete agreement with The on something after all! Watching *my* blue again Blue Jays right now, for instance. I dropped them during the BFBS years, but they’re back in my top five. On several occasions I’ve been sorely tempted to dump many of my favorite teams over poor sartorial choices. Look at the Padres, who used to look like tasty tacos and now resemble a bowl of cottage cheese. I find, though, that I drift back to them because in the process I’d bonded with them over other things. And because, you know, my own sartorial taste isn’t really that good..
Look at the Padres, who used to look like tasty tacos and now resemble a bowl of cottage cheese. I love that line and I’m going to borrow it. I grew up with the old Seahawks uniforms and still love them. I don’t hate the new ones, but I don’t really think…I don’t know what to think yet. However, this must be said about the colors: I agree with Ricko, it’s not really neon green. It’s bright, that’s for sure, but it’s not neon. And it’s not snot. If you took a hike in the Olympic National Forest you would see this color everywhere. It is the color of wet moss with sun shining on it in the rainforest. I don’t mind it at all. Where is there a lighter shade of green in the NFL? The Packers and Eagles are boring dark green. As long as the Seahawks have to be the billionth team with navy blue they might as well have a nice green to go along. I agree Dan. It’s not overly bright like the last green iteration, however the color is a nice accent to the dreary navy blue-gray combination. As a graphic designer, I love that the jerseys now compliment the helmet and logo with design element repetition, instead of a generic striped sleeve jersey. I also refer to the neon green worn by the Seahawks as X-Box green. I’m pretty sure any Paul Allen-owned team must have X-Box Green in it somewhere. (See: Seattle Sounders) Although, I guess I can’t imagine the Blazers doing that. interesting what nike did with the seahawks. i wonder what the bklyn nets adidas inspired unis will look like. In short, they’re not adidas inspired. The identity wasn’t designed by adidas at all, really, save for a few details that were incorporated from adidas’ work on the project. Paul’s seen ’em, and he likes ’em, so stay tuned. so, what don’t you like about them? Name suggestion for the Nike version of the Reebox: Swooshbag (rhymes with douchebag). “Swooshbag” is brilliant!!! I love it! And it has the same amount of syllables as Reebox and also a similar “b” sound to start the second syllable. yup, that’s it. liked ‘bubble,’ but swooshbag nails it. AWESOME, Jimbo. Pure unadulterated awesome. OK, so we’re all in agreement? We’re going with Nikiosk? I think we’ve seen some of these released piecemeal, but here are all 32 Euro 2012 jerseys in one place. Sweden’s got the best of the bunch. The dark jersey with the yellow sash is a beut. Almost all of them are good. Some are great. Poland’s is decent but that swoosh just looks excessively huge compared to the other jerseys..
Portugal’s white jersey is terrific. Not a fan of the blue one for Spain. And what in God’s name is going on with Ireland? That idiotic mobile phone company logo ruins what would be a really nice-looking jersey. Why do they have a sponsor when none of the others do, anyway? Heh, if you hadn’t said it was a phone logo, I’d have just assumed it was a jersey with the number on the front. The Republic of Ireland’s jerseys when worn in a FIFA / UEFA competition never have the sponsor on them. They’ll have the player number like everybody else. That’s a rule. However, the replica jerseys that the fan can buy in a shop will have the mobile phone sponsor. It’s nigh on impossible to buy one without it. The FAI who run football there have done this for decades now. It used to be Opel, a car manufacturer. They’re the only national association that does this with replica jerseys. For money, of course. So those are just pics of replicas, then? Well, OK. I guess those should be some damn nice-looking jerseys in real life. Sweden’s jersey is a beaut, but it’s a terrible shirt for Sweden. Should be light blue! Co-host Ukraine shows their Scandinavian brothers how it’s done with their nigh invincible light blue and gold shirts. Several of them, such as Holland, have over-the-shoulder strips that make me think of these uniforms. For Holland, the orange shoulderboard serves only to highlight the Mark of the Beast, not the national crest, which is all kinds of wrong. And damn FAI for that sponsor logo. That’s otherwise my favorite Ireland shirt in a long time. I couldn’t think of a good analogy for Holland’s over the shoulder stripe, well done Mr. Scott. As for Ukraine, I’m sure there’s some nationalist reason for that patter on the chest, but goodness, it is horrible. Add the odd crest and some horizontal stripes and the sleeves and those are a jumbled mess. Germany is reviving their green away jerseys. I need to pick one up, they’re gorgeous. This half-Pole is ashamed to admit that Russia and Germany look so much better than the land of my ancestors. Croatia rocks as well. So does Sweden. France and England are solid. My congrats to Paul and his quest of true abstinence (if it’s one thing baseball fans don’t like, it’s a cheater). 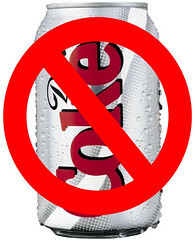 Tho I have a few boycotts of my own, none are as bad as Diet Coke & that could be enjoyed once in a while as a treat. I’m sure if I drank two liters in a day of anything I don’t think I would enjoy it at all & variety is the spice of life. Like coffee, less is more. No but seriously, I think the new Seahawks digs are actually an upgrade. Would have been even better with a grey helmet but my gripes and fears with Nike’s vision is that there is little emphasis on socks. Those are sooooooo plain. No stripes. I understand there should be one solid colored half sock but a stripped one would have been nice. 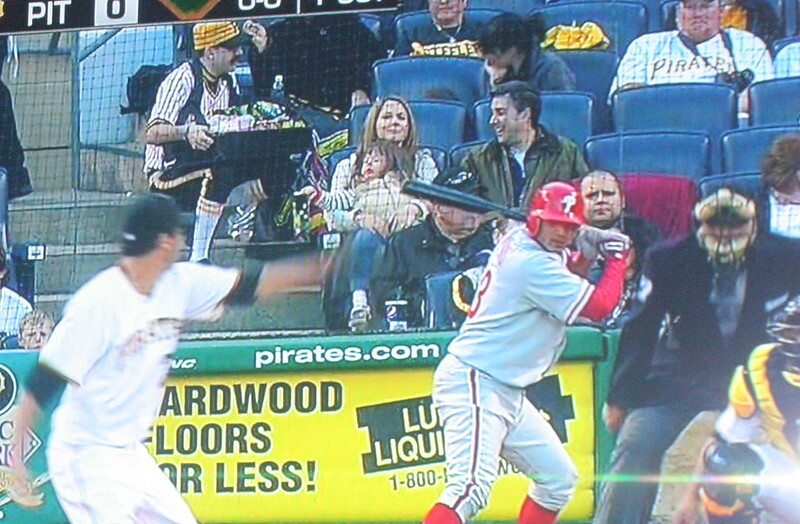 That Pirates peanut vendor has a name and a Youtube video. Screw Diet Coke. The only thing to wash down a warm brownie is a super-cold glass of Ovaltine. Vitamin D white milk, please — or you get too much chocolate/sugar and there’s no flavor contrast going on. lol, you don’t get to play the role of the pot calling the kettle black, Jeff. Steaming hot brownie, scoop of vanilla icecream on top, and a glass of ice-cold skim milk (because I don’t want to make myself fat[ter]). I’ll buy that. Sometimes you need the blandness of the milk to counteract the sweetness of the brownie. Though I didn’t specify WHICH Ovaltine. The original malt (in the yellow can) would prevent the chocolate sensory overload. RIGHT! exactly! you need the flavor contrast. straight white milk with the brownie. I drink 1% milk from Safeway, can’t tell the diff between that and 2% and the regular straight stuff. Boy, I want a brownie now. Especially the corners where they’re crunchiest. I was going to say. Washing sugar down with sugar? Does nobody fear diabetes? We eat WAY too much sugar in this country. What the hell is wrong with you people. Coffee is the only acceptable answer here. Coffee & a cigarette – it’s a winning combo! Matt Carpenter of the Cardinals does not wear batting gloves. And he’s not even a catcher. Shocking development: Marlins in black again for the Phillies’ home opener. Since we already have Reebox, why not Swooshbox? I thought “oil can” but those are too varied. Maybe “drip” or something. To those of you against alternate jerseys, do you consider this disrespectful? I feel it falls in the same category. An alternate top on Opening Day disrespectful? Absolutely. There’s a reason why they designate unis for home & road status, but teams just don’t understand this anymore. Too busy trying to promote the gift shop. The visiting team wearing softball tops on Opening Day feels disrespectful to me. If the home team does it, it’s just being dumb, not disrespectful. Same here. Plus, the minors are not the majors. In the minors, teams rely on gimmicks to get paying customers through the turnstiles. Much as I love when the Nats wear Senators or Grays throwbacks, I don’t want them doing it on Opening Day. But if my local single-A Potomac Nats need to wear green tutus on Opening Day to sell tickets, so be it. Watching the Phillies game now. I’ve noticed (no screen shot) that bats now have logos where the camera can catch them, 180 degrees opposite the normal logo at the barrel end of the bat. Used to be that bats had one logo stamped in the middle of the bat on the side of the grain edge, and we were always told to “keep the logo up” so that we wouldn’t break the bat. 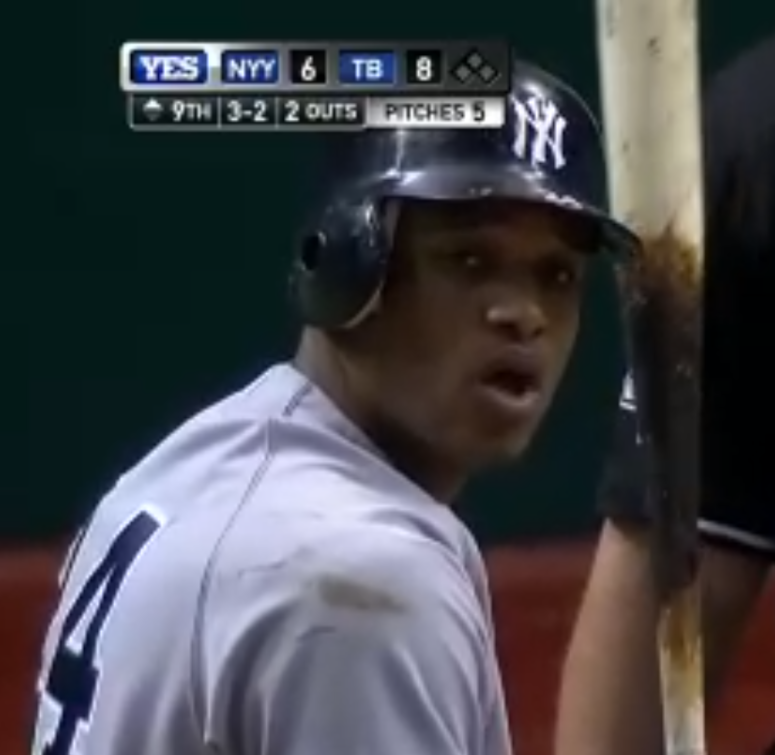 Problem with that is that you can’t see the logo when the camera shows the batter in the batter’s box. But now, with an additional logo stamped on the end of the barrel end of the bat we are now able to see what kind of a bat the batter is using. Logo creep on bats. So the Phillies wear their cream alts on Opening Day because they always wear those uniforms for home day games. But the Reds wear their home whites on Opening Day, even though the red softball tops are the designated daytime home uniforms. I appreciate consistency, but think the Reds are right to make sure they wear their traditional home whites on Opening Day. Reds > Phillies. It is a maxim as true in general as it is in this specific case. A foolish consistency, after all, is the hobgoblin of Philly minds. 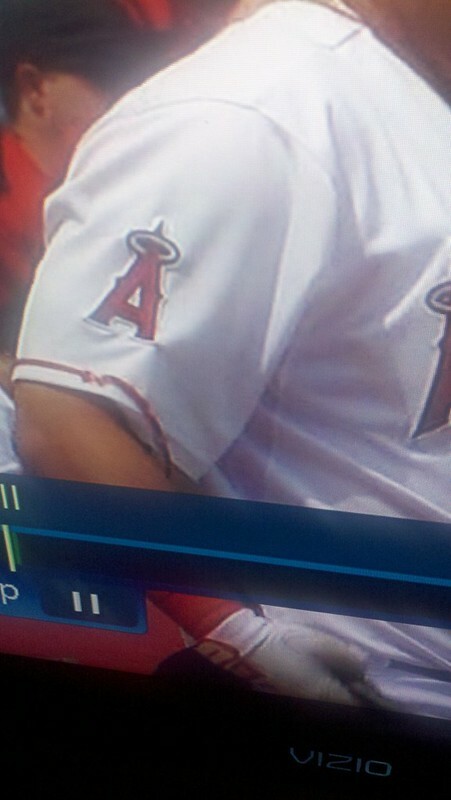 Candy canes are for Christmas stockings, not for baseball uniforms. Vancouver Grizzlies Haida Trim was sensational! Patterns in the trim can look great, tho’ sometimes they’re overdone (first-year Phoenix Coyotes). I often found myself wondering how the Griz would have looked with good old black road uniforms and that snazzy trim. I just realized that if the Colts draft Andrew Luck, they will have a quarterback with a last name that is related to their helmet logo: a horseshoe is a symbol of good luck. Have there been any other quarterbacks with last names that related somehow to their team nickname or logo? Or any other players at different positions? Feel free to think of athletes in other sports as well. Probably the most famous example is the fact that Jim Brown played for the Browns. Chad Bengal used to play for the Bengals. Or any other players at different positions? “Jumbo” Elliot on the NY Football Giants. Marcus Washington was once a linebacker for that team with the indigenous/racially insensitive moniker. Shonn Greene plays for Gang Green. Darius Marshall played for Marshall University. And they also had a wide receiver named Darius Passmore. “Passmore” is appropriate for his position. I think the greatest position-appropriate name of all time HAS to be Chuck Long, who was a quarterback for the Lions and Rams. Johnny Bench would’ve been appropriate too IF he was a backup. Pretty ironic last name for arguably the greatest catcher of all time. Sorry, but most position-appropriate name was Early Wynn. I’m not a big baseball fan, so sorry if this is a stupid question, but is “early win” a term used in reference to pitchers? I’ll have to hear an explanation of why Early Wynn’s name is the most position-appropriate before I decide if Wynn’s name or Long’s name is better. Starting pitchers get credit for a win. If you’re really good, you win it early by befuddling the opposing hitters. And “Chuck” is a term for throwing something. So he quite literally would define his success as QB by chucking the pigskin long. Tim Corcoran wore the Twins’ TC in 1981. I’ve seen a lot of great suggestions today, with The Check-Box being up near the top. Well done, everyone! To the reader who suggested Reebox carry over to the NFL’s new product, I must say, I completely agree. The meaning is universal. Kleenex, Band-aids, and The Reebox. We all know what they refer to. the Birmingham Cudas…the one team in a long line of failed minor league football teams (sorry CFL) that you never hear people speak of here in B’ham. Looks like Barry Zito’s gone back to the solid black socks. Seriously, back in the day- #75 (will not type or say his name) had -the- most -deadly- curve ball I have ever seen. He’d make guys look just stupid @ the plate. Then he came here and has been just BEYOND poopy. I’d give anything to see his release- worst contract ever by far. If we can get to the 7th with a lead today that would be swell. 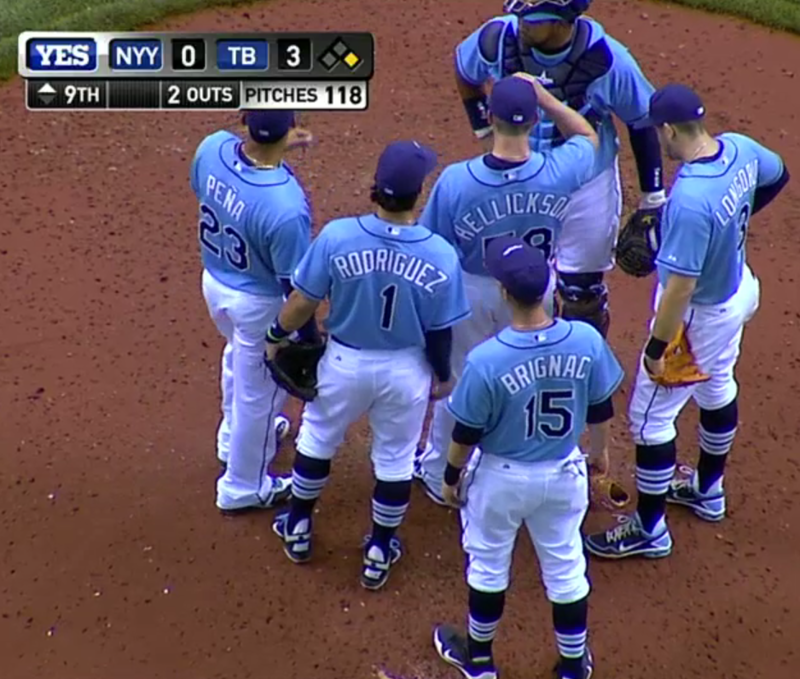 It wasn’t just Longoria, Brignac and Rodriguez that wore striped stirrups for the Rays yesterday. Ben Zobrist and Jeff Keppinger also wore them, but by the time that pic was snapped in the 9th, Keppinger was pulled (in favor of Brignac) and Zobrist was in right field. I believe LF Desmond Jennings was also wearing them, but I can’t remember. On that note, I decided a good way to celebrate the Rays’ sweep of the Yankees by wearing my own Rays stirrups to class as a good-natured jab at my Bronx-born professor. Every manufacturer is going to have their own area for self-aggrandizement, so I’ll offer up a suggestion that is fully generic and at the same time appropriately inappropriate —Â the “glory hole”. The Seahawks uni’s remind me of the Junior Seau era Chargers. Paul- Make sure to enjoy your time with your Mother. I lost mine last year and I miss her daily and realize that I didn’t spend nearly enough time with her. The Cleveland Indians new home jerseys without the head spoon look great! This question might sound sarcastic but I asking honestly…do the Marlins have gray road jerseys? I dont remember from the unveiling. Jays are looking smooooooooooooth in the home whites. Dang! Played smooth until the 9th, too. Can’t wait to see them against the Orioles. If there was a baseball 5&1, that matchup would be a sure-fire Top Fiver. Hey Paul, is your snot really that bright? Chi Sox wearing their road grays for the fourth game in a row. This has to be a record for the last couple of years! As a fan this excites me, hate the black softball tops. How ’bout it? Crazy, eh? Seriously, the last time I remember them wearing the grays for this many consecutive road games was the ’05 postseason. Which, incidentally, was the last time I was actively rooting for them. If they keep this trend going, I might start doing that again. Would be great to see them stick with the red 70s Sunday throwbacks as their sole home alt and save the black tops to be worn occasionally on the road. Big thanks to the 17 people who have entered the pool thus far. I’m sure there will be more, but the prize pool is growing steadily. Once all of the entries have been collected, I’ll post the offerings in this year’s HBIC Playoff Pool. Serious question, Teebz: what do Canadians prefer to eat at a ballgame? Was going to make hot dogs while watching the Jays tonight, but then I changed my mind. Didn’t have anything that resembled Canadian cuisine, so I settled for shredded wheat and a glass of lime seltzer. Now when I listen to Vin Scully while watching my Pirates take on the Dodgers, I will be eating hot dogs. Noooooo doubt about it, as Lanny Frattare used to say. We eat hot dogs in Canada! In fact, you can even debate between grilled and steamed! I prefer grilled whenever possible, but settle for the “steamies” if I must. Ideally, mustard, onions, and relish. No coleslaw on top of my hot dogs. And especially not ketchup. //I’m not Teebz, but I did go to McGill. So no mayo on dogs or anything like that. Good. OK, when I watch the Orioles take on the Jays later in the week, I’ll have hot dogs and mustard. Normally I’d use Stadium, but in honor of one of Canada’s languages I’ll use French’s. Get yourself an EX or a Blue and you’re good to go, eh! PS: In retrospect, I don’t remember ever seeing any sort of spicy, deli, or brown mustard in Canada. Just French’s and Dijon. And Dijon sure ain’t on hot dogs (or smoked meats)! So believe it or not, that’s fairly accurate, if you’re all a-boat emulating the Canadian experience! I nominate the swoosh-y area be called the “swoosh-pa” with the pa in reference to fupa. Look it up if you are not familiar with the fupa. So simple – I miss the Lehigh Valley sometimes. For those of you getting the free MLB preview, I heartily recommend the Pirates announcers (of course), the Blue Jays feed (I love listening to Buck Martinez), the Mariners broadcasting team (Dave Sims? Only reason I don’t think of Big East basketball is because he sounds a little like Buck Martinez) and the Oakland A’s announcers (they’re very personable). The Orioles feed is good, too, with either Jim Hunter or Gary Thorne with Jim Palmer. And, of course, listen to the Dodgers feed whenever you can. Vin Scully’s still going strong, calling the game all by himself. Just a joy. The GM logo Renaissance Center in Detroit is actually a big LED screen. It changes from GM’s logo to those of its brands (Chevy, Cadillac, etc.) depending on the minute. It probably just changes to the Tigers logo for a few seconds during games. As far as I am concerned there is no win with the Seahawks uniform. They are now the Oregon of the NFL. As for the caffeine withdrawl…keep with it, sir. 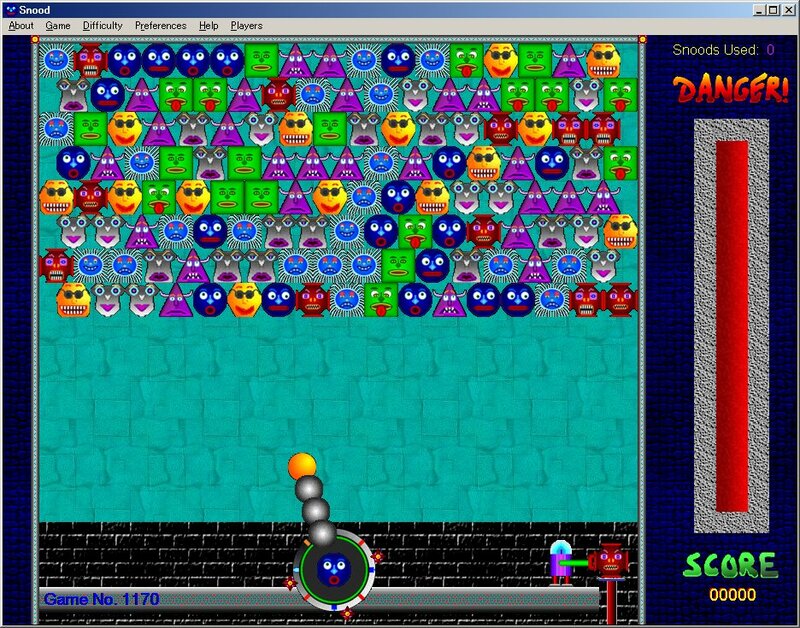 It was the best thing I ever did during my undergraduate career. I weened myself off of caffeine (especially dark sodas) and now I can survive and entire day off of a single cup of coffee or a single “clear” soda. Your internal organs will thank you later. The 1995 Birmingham Baracudas appear to be using the same uniform scheme as the early World League of American Football (Now NFL Europa). There is something interesting and awesome about that design.